This is a very simple bell pepper recipe. The marinated pepper slices make a tasty appetizer. Serve them with French bread slices, or add them to salads, sauces, burgers, or sandwiches. 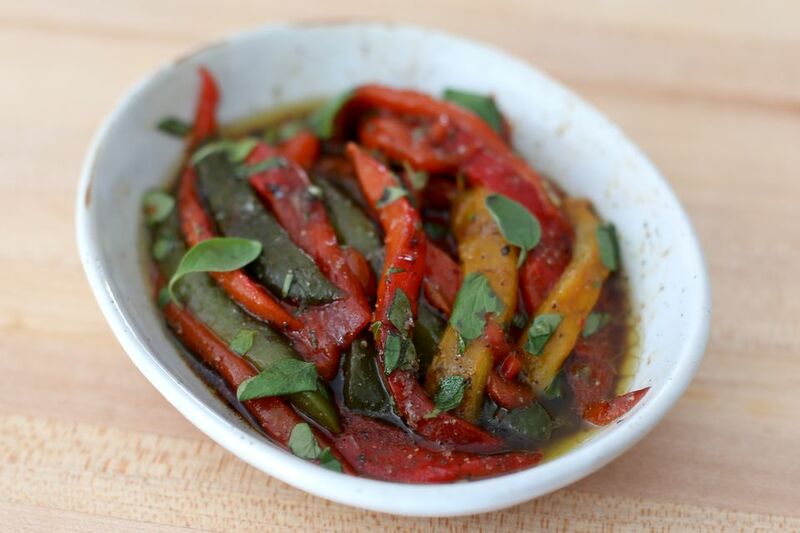 The peppers are marinated in a mixture of olive oil, balsamic vinegar, and fresh herbs. Cut the peppers into large flat pieces. Arrange them on a foil or silicone-lined baking sheet, skin side up. Broil the peppers about 3 to 4 inches from the heat source until well charred, about 10 to 12 minutes, turning the baking sheet around after about 5 minutes. Immediately transfer the charred peppers to a food storage bag and seal. Let them steam for about 15 minutes, or until cool enough to handle. Peel or scrape the skin from the peppers and slice into strips. In a cup, combine the remaining ingredients. Put the peppers in a small serving dish and toss with the marinade. Makes about 1 to 1 1/2 cups.